After getting down the basic functionality, I wanted to polish up the app to give it a quality feel and to dig deeper into the nitty-gritty details of MapKit. So I made a list of things that could be improved and proceeded to knock each of them out one by one. *I had the most fun with this one. 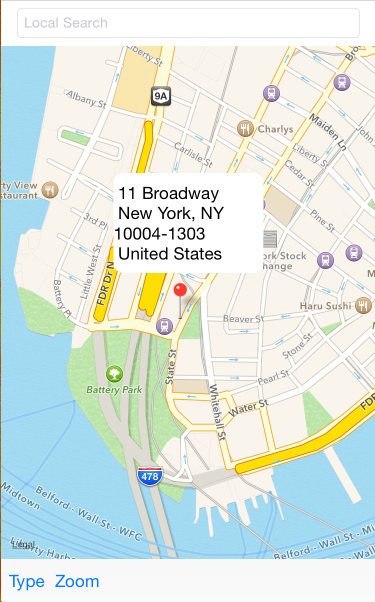 When the app loaded, the default map showed the United States and when the user location was updated, it would move center on the current location, leading to a jumpy effect (I didn’t know about setCenterCoordinate: animated: at the time). The jump came about a couple seconds after opening the app depending on the internet connection and lead to a laggy feeling. Initially, I chose to not center the map on the current location because it was a quick fix. I let the user tap the current location to zoom in. I chose this because it was the easiest fix. After some iterations, I decided it was better just to zoom in automatically. 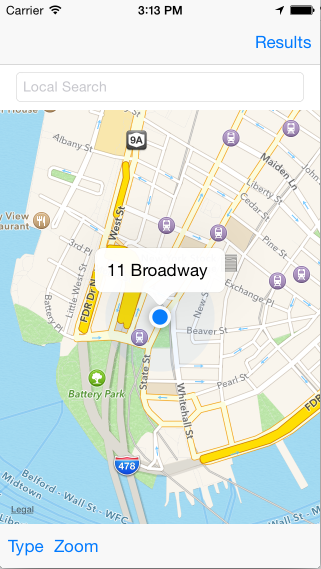 Many of the map apps that I’ve seen have floating buttons on the map instead of a toolbar. I planned to do this, but it didn’t seem worth the effort. After looking at the default maps app and seeing that it used a toolbar too, I decided to save time and stick with the toolbar. I just separated the buttons to make it more symmetrical. Before, I had the callout for the last search result come up. This lead to the map whipping to the last location when it was off the visible region. Make the first search result come up. How do I select a MKPointAnnotation? The view for the address callout was too small to show the whole line for city, state, and zip code. The easiest way to fix this was to make the view wider and shorten the zip to five numbers. Afterwards, I ran into problems with special places that had an extra line for the placename, so I had to add extra code to parse the formatted address lines in cases where there were two or three lines. In the final version, the callout view is now a bit too big, so future work may be nice to set the size dynamically and even animated. Easy, call the zoomIn method that the zoom in button calls. The touchesBegan: withEvent: method detects when I touch outside the textfield onto the map, so this was easy to fix. With the route shown, it was natural to want to show the directions and the distances involved. The easiest thing was to show the directions in a tableViewController and segue to it from a UIBarButton on the navigation bar of the directions page. This is pretty standard, so I just passed the instructions to a table view controller and displayed it in the cells. The distances are currently in meters. That’s not very intuitive so it would be nice to have this in blocks. How do I zoom in to fit two locations on a map? Get the coordinates for your location and the destination location. Find the difference in latitude and longitude and scale this up by a multiplier. A multiplier of 1 will have both locations on the edges of the screen. Make sure to get the absolute difference. Negative numbers are no good. Make a MKCoordinateSpan with the ABSOLUTE differences in latitude and longitude. Find the average latitude and longitude to get the center for the region. Make the MKCoordinateRegion with the centerCoordinate and the span. Find the adjustedRegion by calling regionThatFits on the region in the last step. Set the MKMapView to that adjustedRegion. 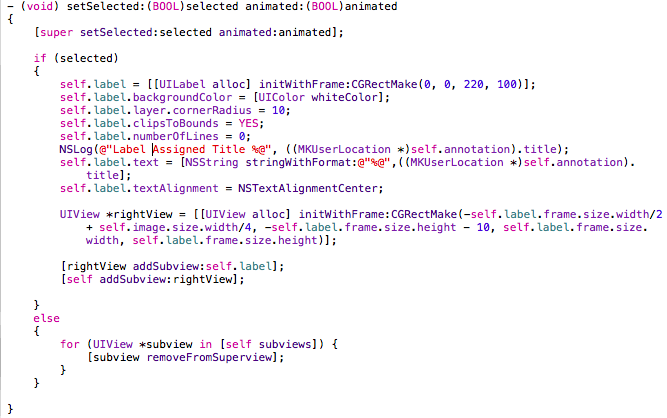 The cool part about this code is that it doesn’t care if it’s zooming in or out. It just zooms perfectly to the right region. I had to play with the scalingFactor a couple times to get it to look right. 2 seems to work pretty well. To do this, I needed to get the estimated time for walking directions. A note on directions. If the MKDirectionRequest has the transportationType set to walking and the destination is not walkable, then the service will return no results. That’s why the transportation type is defaulted to any. After I knew that there was no error, I would check to see if the response.expectedTravelTime was greater than 15 minutes (how much I’d be willing to walk). If it was, I would change the MKDirectionsRequest’s transportType to include driving and find the directions with the modified request. With the asynchronous call within the completion block, this might be a good candidate for wrapping the asynchronous calls using promises. Pretty simple. Just pass the region from the first MKMapView to the search results view controller to the RouteViewController through the prepare for segues. At the end of this process, I had an app that I could actually show people and it feels really good. 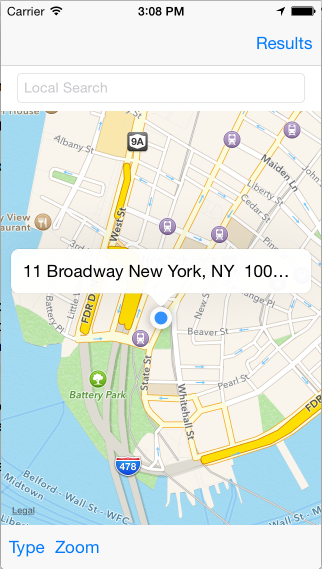 After following the tutorials in part 1, I wanted to keep exploring MapKit. As reverse geocoding was my next topic, I wanted to show the address of the current location in a callout (view that pops up above the pin). 1. How do I know when the current location is tapped? that is called when an annotation is tapped. How do I tell that this annotation is my current location? Notice that the annotation is any class that conforms to MKAnnotation. Current location comes in a special class called MKUserLocation so you just need to test if the annotation is that class. Within this if statement, I need to turn the currentLocation into an address. This MKUserLocation has a CLLocation property, a BOOL property for whether it’s updating, a CLHeading property, a title and a subtitle. All you need is the location which comes from MKUserLocation’s location property. What does the completion handler return? placemarks is an NSArray of CLPlacemarks. Each placemark has an addressDictionary. The key @”FormattedAddressLines” returns an array of formatted address lines. Typically, there are three lines. One for address, another for city, state, and zip code, and one more for the country. In some situations, there are four lines where the first is the name of a venue. 3. How do I display the address? When I do this, the problem is that there is only one line and the rest of the address gets cut off. Adding line breaks to the title did not make it appear on additional lines, but only displayed the first line instead. Messing with the left and right accessory buttons did not help either. With no way to set more than two lines of text, I had to make a custom MKPinAnnotationView. How do I make a custom annotation callout? Since the callout is a property of the MKPinAnnotationView, I had to make a subclass of the MKPinAnnotationView and overwrite the setSelected: animated method. Add the label as a subview of view. Why MKPinAnnotationView and not the default user location view? The default user location view is a class that you cannot access or subclass. Up next, making things look pretty.